I had the opportunity to meet Paris-based Brazilian visual artists Angela Detanico & Rafael Lain who've been staying in Kyoto for a six-month artist residency program at Villa Kujoyama. For their next project, they are researching the connections between Kitasono Katue, a Japanese avant-garde and a group of Brazilian poets called the Noigandres group. Detanico and Lain work in a wide range of media, including graphic design, digital art, sculpture and large-scale installations. Influenced by Brazilian concrete poetry of the 1950s to 1970s, their artwork is focused on language and typography, delving into the graphic representation of words. Their collaboration is a fertile match, for Detanico specialized in linguistics and semiology, while Lain was a graphic designer before they started collaborating in 1996. 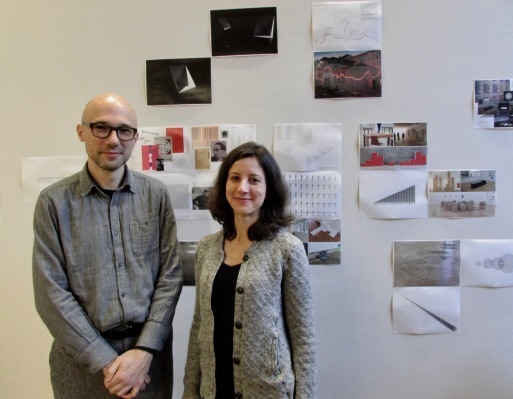 Their work has been shown internationally at venues such as the Venice Biennale (2007), Sao Paulo Art Biennial (2004, 2006, 2008) and Havana Biennial (2009). I will introduce some of their works that particularly impressed me. 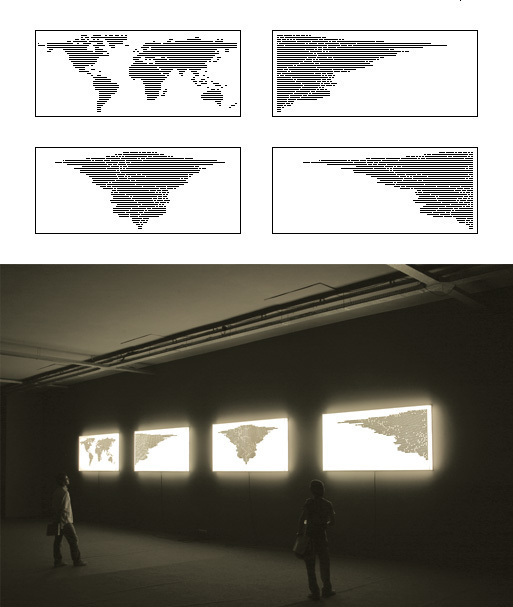 These digitally generated images of the world map with extremely simplified figures in horizontal lines offer some different perspectives regarding global politics. It can be simply seen as the flow of people, goods and information around the world that accelerates economic globalization. For some it also can be interpreted as the world swinging from the Left to the Right over the anti-immigrant anxiety and anti-Muslim hysteria. In that sense, the artwork, created in 2004, well predicted the backlash against globalization and neoliberalism the world is currently undergoing. 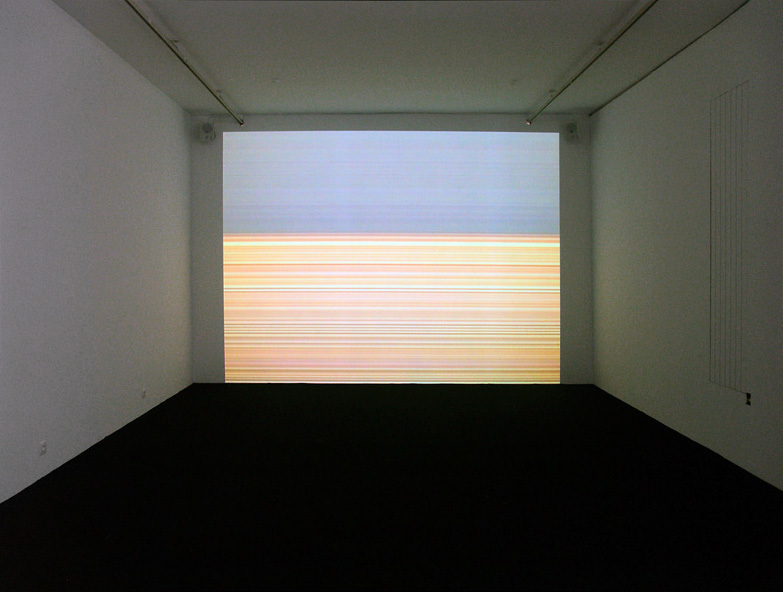 In 2004, Detanico and Lain were awarded the Nam June Paik Award for their video installation "Flatland" which explores the perception of time, space and reality. 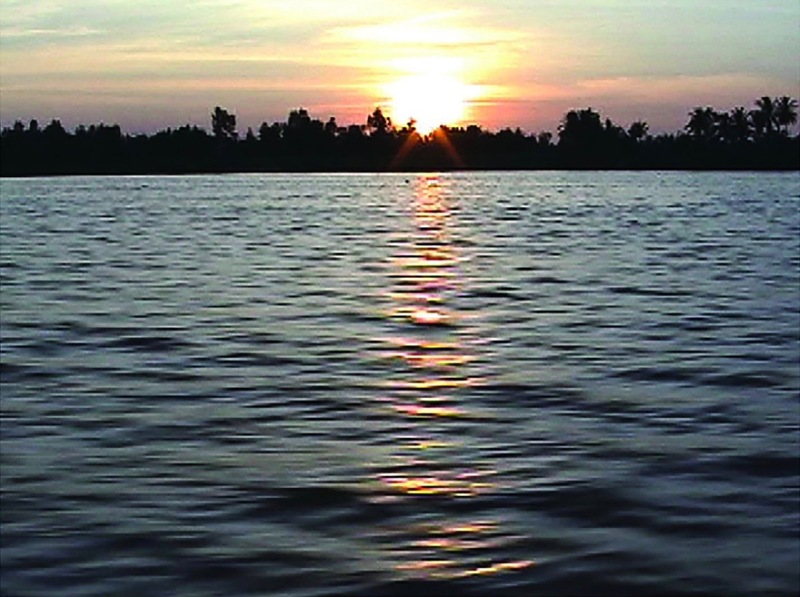 The video of the Mekong River Delta, also known as the Flatland, was shot from a boat from dawn till dusk for a period of fifteen days. Eight video frames were selected from the footage and each pixel of the digital images was sliced in columns and extended horizontally to the original frame size. The process was repeated 640 times for each image, covering its entire surface. The digitally processed landscape with multiple layers of colors is accompanied by sounds recorded on the boat, such as the sound of waves lapping the boat, throbbing boat engine noises, radio static and a rasping voice and popular local songs from a radio. When staring at horizontal layers of colors, some may think the digitally processed sunset is more beautiful because it's clean and clear, or some may even feel that they're looking at a sci-fi sunset 100 years into the future, while familiar sounds pull them back to nostalgia for the past. The literature-inspired series "27 rue de fleurus" is based on Gertrude Stein's abstract and experimental poetry. In the early 1900s, Stein collected paintings of notable artists such as Picasso, Matisse and Braque that hung in her residence at 27 rue de Fleurus in Paris, which became a lively salon for artists, poets and writers. Detanico and Lain focused on the relationship between art and literature, especially painting and poetry, as well as how Stein had taken inspiration from modern paintings on her walls since she was often referred to as "the Cubist of Letters." 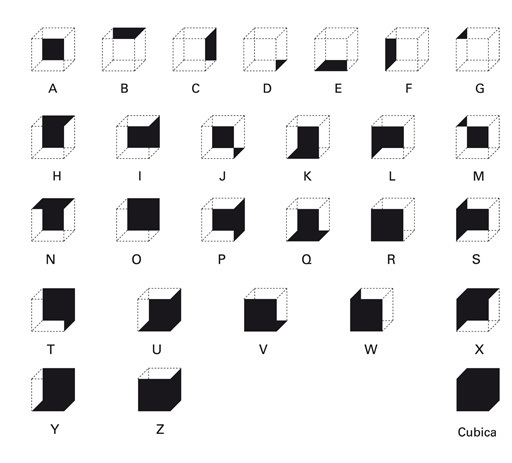 They invented a coded alphabet based on cube geometry, painted the sides of each cube in a black that determines each alphabet character and applied that new typography to Stein's poems. Colored typography is almost like Egyptian hieroglyphs or ancient pictographs. Its delicate, subtle colors are adopted from the master paintings hung on the walls of Stein's salon. The artwork introduced above uses Stein's poem "A Carafe That is a Blind Glass" from her poetry book Tender Buttons (1914), and uses colors from Picasso's painting. Detanico and Lain have done many works that have referenced famous philosophers, physicists, writers and poets. It is their way of communicating with cultural intellectual figures of the past. While converting those profound phrases and verses into digital art forms, they define their own style that is visually appealing with graphic displays. Their digital experiments with language and typography have created a new esthetic impact that has taken concrete poetry to another dimension. 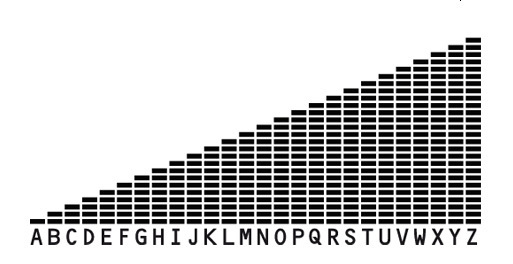 Once you become familiar with their alphabetic and typographical systems, their sculptural series of works "Pilha" (meaning "pile or stack") will appear more playful. One of the "Pilha" series is called "dito e feito" (meaning "said and done") consists of copies of John L. Austin's book How to Do Things with Words. 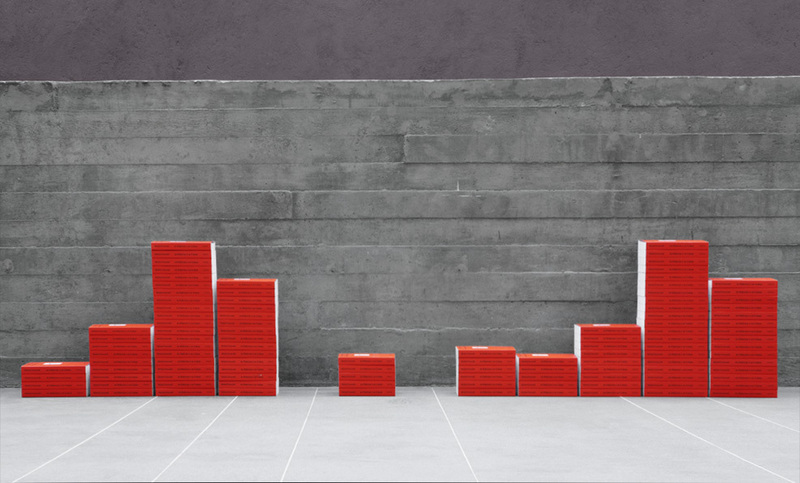 The essence of the book becomes visible in a concrete way by piling up books. The titles of "Pilha" series have a sense of humor and playfulness. By piling up sugar cubes, erasers, books and bricks, words can be perceived visually as form and mass that embody the meaning of the words and the concept of the books that they reference, or maybe they transcend the meaning of words and defy understanding. 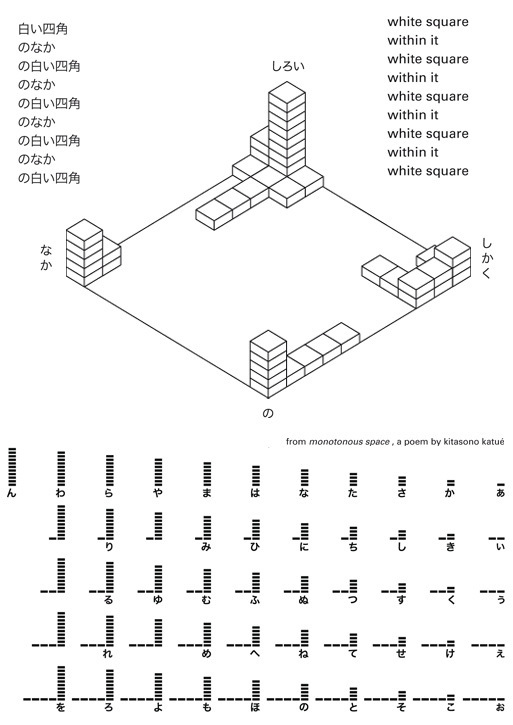 Now, they are working on a new project that they showed me consisting of a piece inspired by Kitasono Katue's poem "Monotonous Space" from his poetry book Smoke's Straightline (1959). This is a variation of their "Pilha" series using the Japanese syllabary. Detanico and Lain's innovative way to convert the material of language into graphic artworks is an exciting leap with profound philosophical implications, a kind of metamorphosis. Just as Stein, Kitasono and others bent language and syntax to make a breakthrough into new ways of perceiving the world, Detanico and Lain twist those poets' language into artworks that invite us to imagine a new way of conceiving the poets' original compositions. The leap between the originals that they base their work on and their creative artworks stretch the imagination and have esthetic appeal. Maybe the most thrilling aspect of Detanico and Lain's approach is that I can only wonder where their art will develop from here.